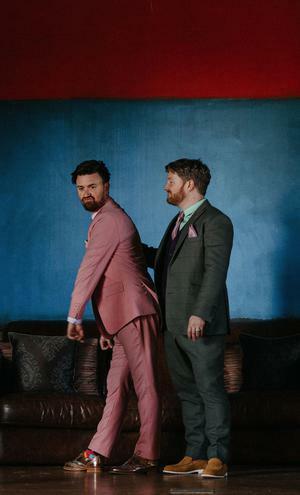 They met briefly the following day in John's home village in Ballina, Co. Tipperary, and eventually arranged to go on a date the following week when they "began to fall in love with each other more and more every day..."
John and Shaun had 'two' proposals - the first, John says rather cryptically was while they were "going around a bend in Limerick as we were driving home one evening".... The second time was perhaps the 'story engagement' and happened at the Oscar Wilde Memorial Statue in St. Martin’s of the Fields, in London. They both knew they were going to take the plunge, but said nothing to anybody before they jumped on the plane. "We went to Tiffany's to pick up our engagement rings and Shaun was distinctly unimpressed when I asked the shop assistant to put them back in their boxes," said John. "We then took a tube to see Oscar, which was where I asked Shaun to marry me." 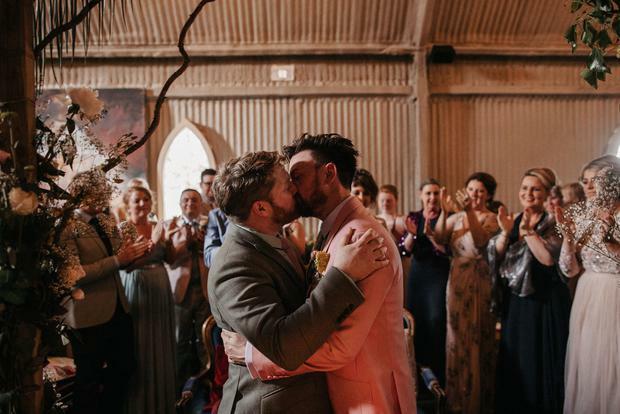 The couple tied the knot in a summer ceremony presided over by Bernie Farrell of the Spiritualist Union of Ireland at Mount Druid in Castletowngheoghan, Co. Westmeath, where they also held their reception. Their photos are by Sean and Kate. 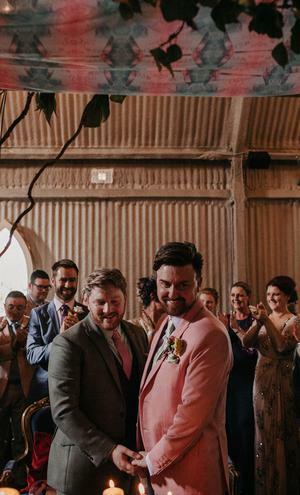 Shaun and John tied the knot in 2016, bet set their date in July 2014. 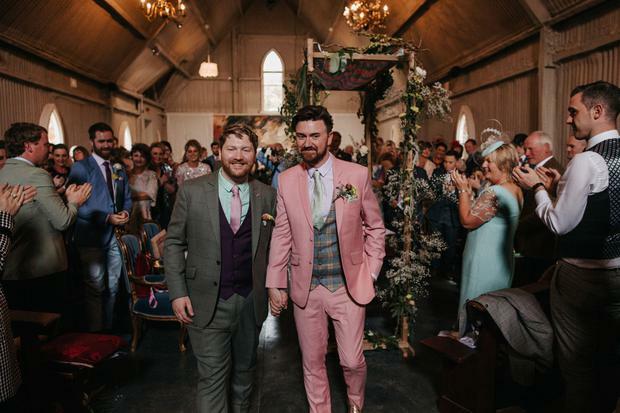 With the marriage referendum on the horizon, they were left guessing as to whether they would be getting married, or getting civil partnered. 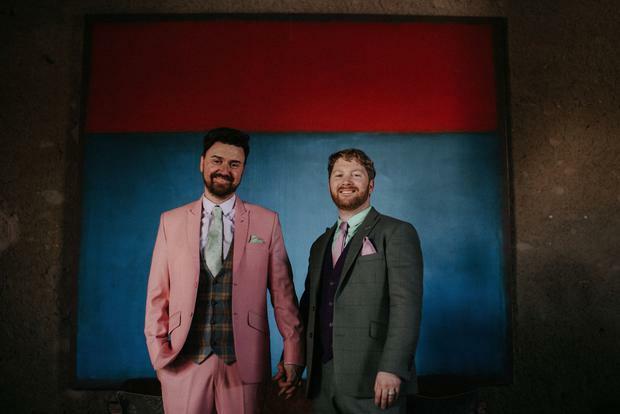 "Once the result of the referendum in May 2015 brought in marriage equality, we were absolutely ecstatic to know we would be getting married in front of our friends and in the eyes of the State," said John. 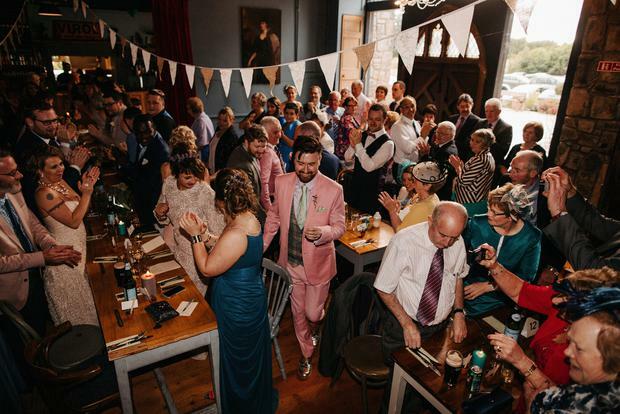 "Thus making decisions around colour schemes, dresses for best women, suits for best men, flower choices, menu choices and table settings were taken from a beginning place of joy and happiness which made it all the more worthwhile." When it came to planning the decor and style of the wedding, Shaun decided in advance to use the Pantone colour chart for Spring/Summer. "This was an invaluable tool as it meant we knew a year out, which colours and shades were going to be in season and could plan accordingly," he said. 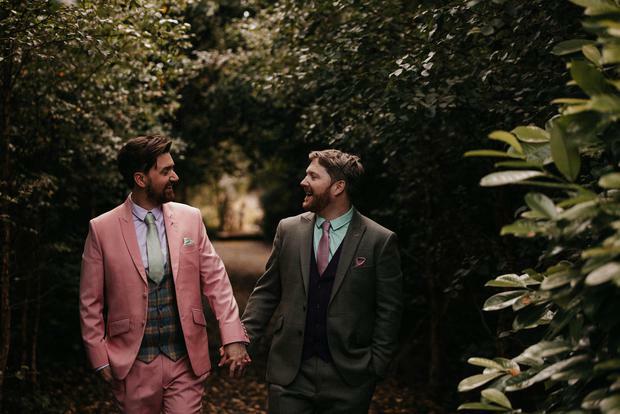 The couple knew they wanted bespoke tailored suits for their wedding from the get go, so arranged to meet Jonathan Haynes from A Hand Tailored Suit Ireland very early on in the planning process. "We instantly knew that we needed to go no further," said John, "as you can see in our photographs, the results speak for themselves!" 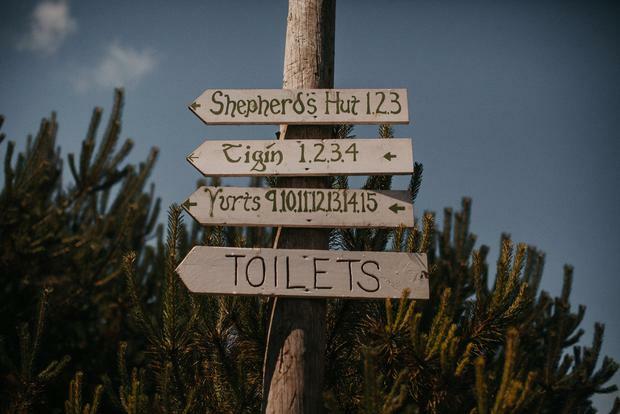 The couple tied the knot in Mount Druid in Westmeath, a popular 'alternative' venues where couples and their guests can 'glamp' in yurts surrounded by nature. "It is simply one of the most magical fantastical places in the world," said John. "The moment you drive in the gate, you are at ease, while the rest of the world and time drifts away." On their first visit, the couple were brought by owner Adrian on a four hour tour of Mount Druid and the surrounding areas. 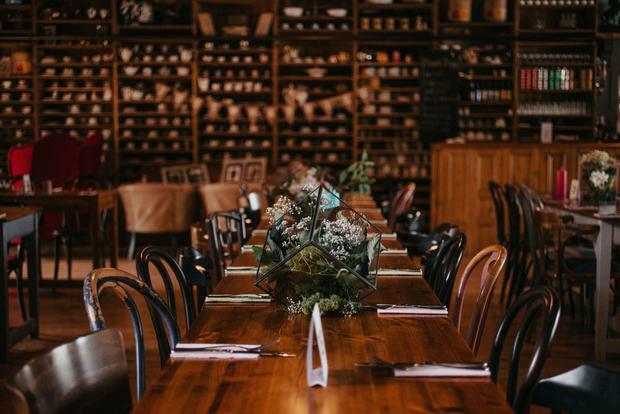 "The freedom that having everything on one site meant less stressing about travel between venues and focusing on individualizing our wedding to match what we wanted to have for our day,"said John. "Coupled with that all of the staff in Mount Druid, Margaret, Deirdre and Eleanor were simply outstanding. Nothing was a problem." 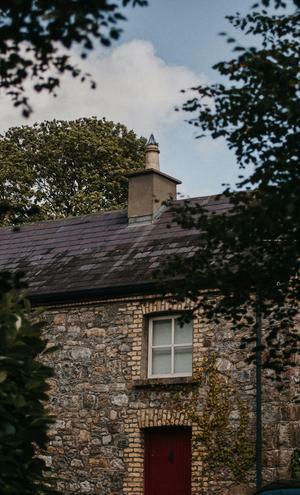 On the day, the couple woke to the sun streaming in the window of their beautiful Honeymoon Yurt and decided to take a walk around the grounds of Mount Druid. 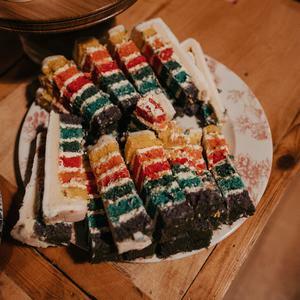 "We strolled hand in hand up to the Barn where the Night Porter graciously provided us with Coffee and Croissants as we sat outside surveying the land where our biggest dream would come through." 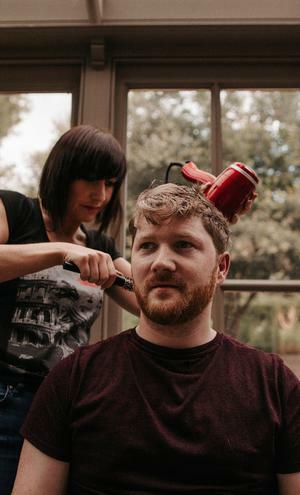 "As people rose the hustle and bustle began and the finishing touches for the three venues were completed and the mammoth task of hair and makeup for the 20+ wedding party began. As we prepared in Kildalin House, time flew by. Shaun’s best woman Orla coordinated hair and make up with Kate, Olivia, and Jodie to ensure everything ran on time." 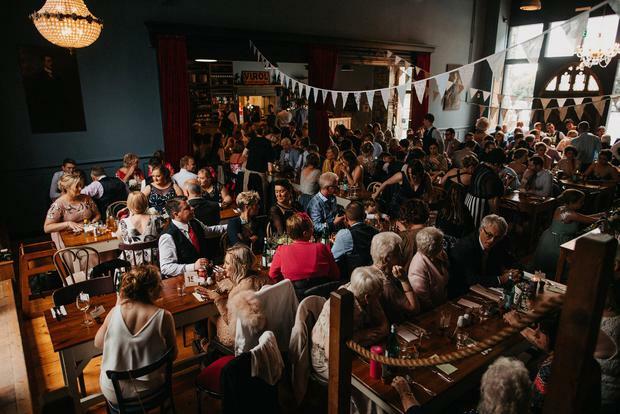 They had breakfast together, wrote their thank you cards and looked on gratefully as their friends and loved ones did "whatever they could to make our day as special as possible." "Our main memory of the day is walking into the chapel and seeing everybody assembled in one place to watch us become one," said John. "These were the people who have had the most impact and impression on our lives and it was a privilege to have them all present as we both became one." 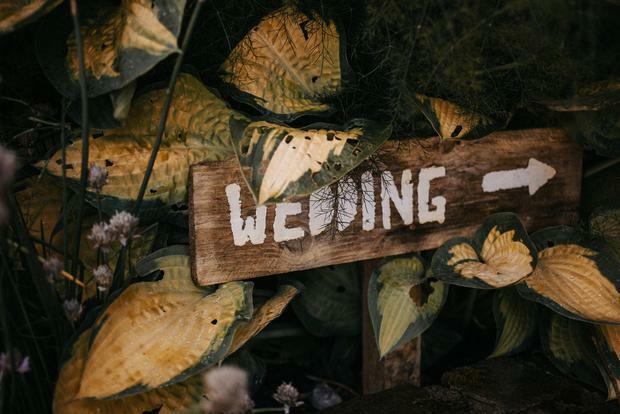 Another memory, John says was watching their hand crafted wedding rings (made by Leonie Hurley in Tralee, Co. Kerry) making their way around the wedding party as everybody passed on good wishes and advice over them. "Plan early," said John. "Know your own mind. Surround yourself with people that love and support you." 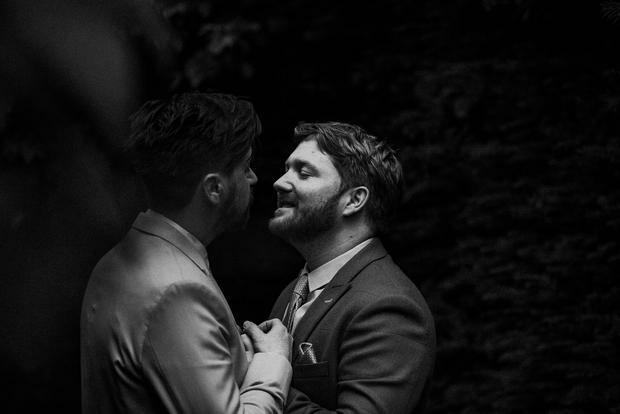 "From day one we knew exactly who we wanted to do certain aspects of our wedding. We knew we wanted Sean and Kate to do our Photography and they are the most professional and amazing people ever. We also knew we wanted to have our Wedding Rings made and our decision to do so was reinforced when we met with Leonie Hurley in Tralee and went through our options. The results were and are breathtaking!" 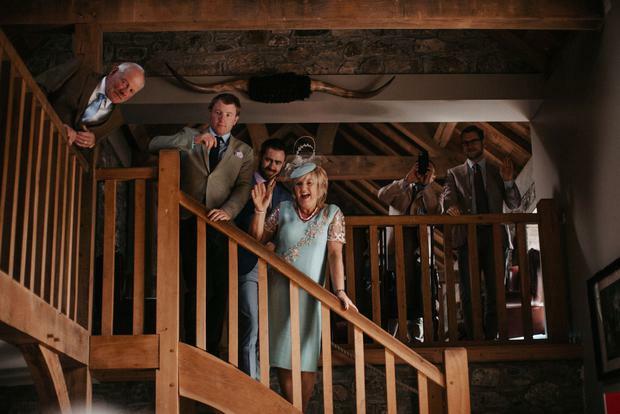 "We felt that wedding invitations set the tone for the whole day," said John, "and with Olivia O’Sullivan we achieved everything we wanted to achieve from these. 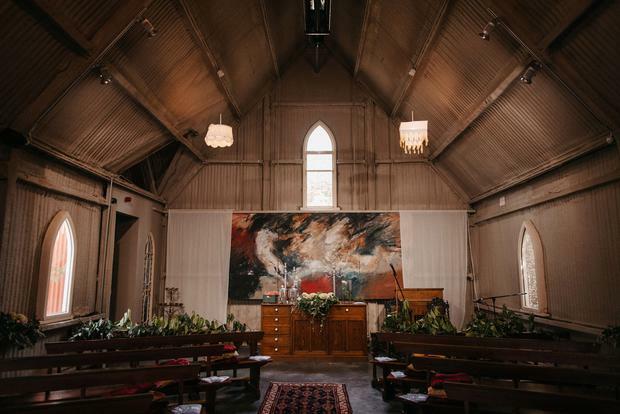 Her attention to detail was remarkable, right down to ordering multicoloured drawing pins to hold the invitations together which complemented the colours used. Olivia also advised us to use a Calligraphy service and we gladly took on Letter Lane Studio and Lucia for this task as it freed us up for other things. Lucia also designed a Wedding certificate for us which all of our Wedding Party signed during our ceremony. "